Here in the Siuslaw Watershed it is spring. That may seem a risky thing to say right now, near the end of March, but just ignore the rain that is most likely falling, take a walk, and be convinced. As soon as you step outside you will notice that our normally green landscape has gotten greener in the last two weeks. Spring is visible from the budding tips of big leaf maple trees (Acer macrophyllum) to the bright green sorrel (Oxalis oregana) pushing through last year’s brown leaf detritus. In the pastures new grass is also emerging through last year’s weathered remains. 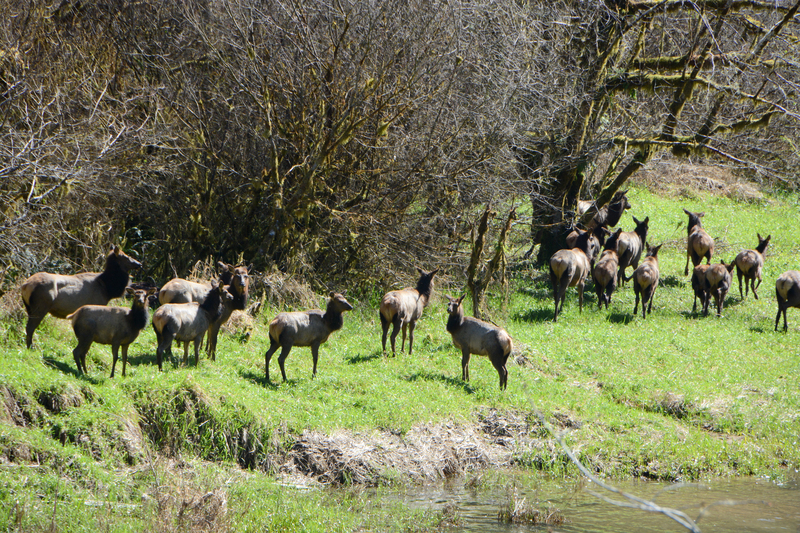 If you are lucky (and quiet) on your walk you may be able to spot a herd of Roosevelt elk that come out of the forest this time of year to crop the new green blades. Looking up into the sky you may catch the darting flight of the barn swallows (Hirundo rustica) that have recently returned to their breeding grounds. If you approach the edge of the forest you will notice right away that the salmonberry plants (Rubus spectabilis), already green, are showing off their bright pink flowers. The Anna’s hummingbirds (Calypte Anna) have noticed this also, so listen for the zing of a busy hummingbird as it takes advantage of one of the earliest native flowers to bloom. Many other trees and understory shrubs are budding, but don’t forget to look down to see what is springing up under foot: Pacific bleeding heart (Dicentra Formosa), yellow wood violets (Viola glabella), Pacific waterleaf (Hydrophyllum fendleri), false lily-of-the-valley (Maianthemum dilatatum), and trillium (trillium ovatum) are some of the plants carpeting the forest floor. Any small streams running down through the forest are great places to spot the now-fading yellow glory of the skunk cabbage (Lysichiton americanum). Take your eyes off of these beacons of spring for a moment to make sure that you are not about to walk into a patch of vigorous stinging nettles (Urtica dioica)! These riparian plants are delicious if harvested carefully and cooked well. If your walk takes you near a larger stream, make sure to study the streambed and the water. You may be rewarded with glimpses of the newly-hatched Coho and Chinook fry, just beginning their adventurous lives. The various species of willow and the Pacific ninebark (Physocarpus capitatus) that will shade the streams later in the summer and provide sheltered hiding places for fish have begun to leaf out. A walk this time of year will be full of discovery. Make sure you bring your best observation skills and maybe some plant and animal identification resources. By the time you are done you will have seen enough of spring to believe that, even without the sun, the dark and dormant days of winter are over.